Hazardous Level: Rats contaminate food with their droppings and urine. Multiplication Level: female rats can have as many as six litters per year, with 6-14 young per litter. The Norway Rat also known as the brown, house, barn, sewer or wharf rat is dull brown in colour measuring 325mm to 450mm (12.5” - 17”). Rats have small close set ears, blunt muzzles and very sharp teeth. Rats are rodents that urinate and drop feces as they run through your home to leave a trail for others to follow and to know where they have been. There are some serious diseases carried by rats include bubonic plague, rat-bite fever, Weil's disease, murine typhus and salmonella. 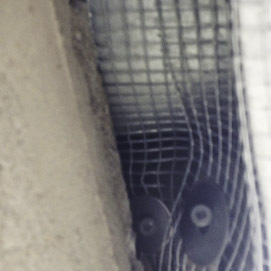 The trained & licensed technician from AnyPest will come to your home and suggest some cost efficient ways of effectively dealing with your rat control issues We will also outline a plan for the effective removal of the rats. We follow a three step procedure for effective rat removal. 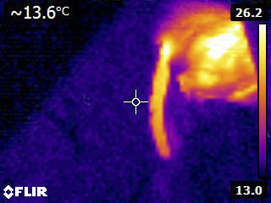 [caption id="attachment_485" align="alignright" width="203"] Rat exclusion[/caption] [caption id="attachment_1266" align="alignright" width="271"] Thermal image of pest rat nest behind wall in kitchen[/caption] Step one - is finding where they are getting in to your home. We then mesh and seal the hole or holes. Step two - if the infestation is high we knock down the numbers with snap traps to prevent smell in the walls of your home. Step three - is placing bait boxes in areas of the house that they frequent (under sink, laundry room) and also bait boxes around outside of house to stop any others from sneaking in. 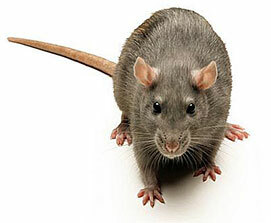 Anypest also has Eco friendly ways of cleaning and disinfecting rat urine and feces. Are Rats hazardous to humans? Yes. Rats contaminate food with their droppings and urine. Rats carry diseases such as salmonella bacteria (food poisoning), leptospira (jaundice) and typhus. What are their breeding habits? Do they multiply quickly? A single female may have as many as six litters per year, averaging from 6-14 young per litter. By three months the young are capable of reproduction. If not controlled an infestation of rats will multiply rapidly. What attracts rats to my property? Food, water and shelter are the three main things that will attract rats to your home or business. If you store food in your basement, make certain it is air tight. Always clean up spills in your home or business. If you have a bird feeder outside, you may want to remove it, as birds often spill seeds all over the ground. Rats love compost heaps so keep that far away from your home, and never stack firewood against the wall of your house, where rats may try to seek shelter. Never throw meat, bones, pizza scraps or fish in your compost as this will further attract rats. Also, remove fallen fruit and nuts from your property. If you are a business, try to not leave places where rats can hide outside your place of work such as skids, milk crates, scrap carpeting, and old boxes. Keep the out doors tidy and unfriendly for rats to hide in. If you have items up against your business wall where rats can hide, they will be able to chew through weak points in walls and gain entry to your home. If I have an infestation of Rats what can I do? It is recommended to seek the services of a trained Pest Control professional, such as Anypest, to eliminate pests for thorough results. How do I make the inside of my home Rat unfriendly? Rats will stick around if they have lots of food to eat. Generally, food stored in counters are easily accessible to rats as they can chew through boxes and plastic with ease. Try putting your food, like cereal in airtight containers so Rats have trouble getting to it, and smelling it. If you have pet food about, try to not leave it around overnight. Also keep lids on your garbage. If you have small children, make sure they aren't leaving candy, chip bags, or candy wrappers around in your home. The above tips will help you minimize the impact of rats in your home and help control the number of rats in the area. Call AnyPest for rat removal services you can rely on.